In a Salon, it is important for managers to ensure cleanliness and uniformity. For this purpose, Salonwear provides you with the best women’s swing coats, ensuring that your employees are dressed uniformly and are protected against all kinds of spills and accidents. These black swing coats come in pretty handy when your stylists are working with liquids. They also help in maintaining a sense of uniformity and style across your salon. Our short swing coats are round necked, comfortable and smooth. They offer ample space for easy movement of arms. 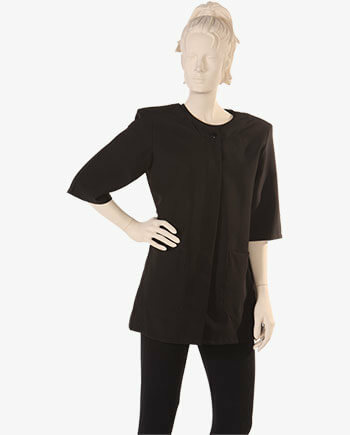 These long sleeve swing coats ensure complete coverage. The comfort level is very high due to the design approach used for these plus-sized swing coats. Apart from these stylish swing coats our collection also includes other designer jackets for salon like 4 Snap Coat, V Neck Coat, Super Coat and many more salon apparels & accessories. Our swing coats are made of polyester. They have 3/4th sleeves with hidden buttons at the front. They also have two front big flap pockets for convenience, shoulder pads for added comfort, and a straight bottom. As always, we put particular emphasis on comfort and style. The use of polyester as the base material ensures that the swing coats last for a long time. This material has a shape retention feature which makes it last even after repeated usage. The ladies swing coats are available in two colors: Black and White. Our black swing coats are timeless pieces, while our white swing coats are equally popular. These swing coats are available in the following sizes: small, medium, large, and x-large. 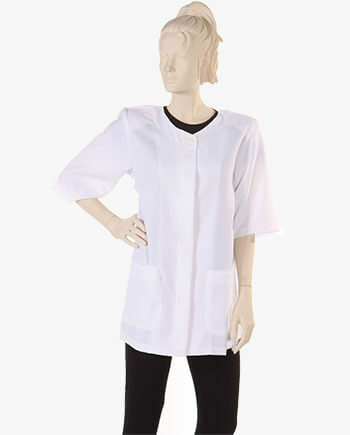 Salonwear offers essential spa and salon apparel like aprons, swing coats, capes, robes, vests, makeup eraser cloth, and many more. Salonwear has established itself as a top shop in the salon niche and has been successfully catering to leading salons across the country since 31 years. Our USA based company aims to provide the best products at the most competitive prices. We offer unparalleled fabric choice in terms of colors and designs. We pride ourselves in retaining loyal and happy customers. Customer satisfaction is of prime importance to us and it takes continuous effort to maintain the satisfaction levels. Furthermore, Salonwear is family business, and thus, we treat our customers like members of our extended family. Apart from offering you a wide range of products from salon apparels to spa accessories, we also help you in establishing your brand. We can customize your salon logo on the products you purchase from us. Our unique customization options include Embroidery and Screen Printing on girls’ swing coats. This remarkable feature of our salon apparels and accessories is one of the many specialties that we take pride in, making us highly preferred over fellow competitors.